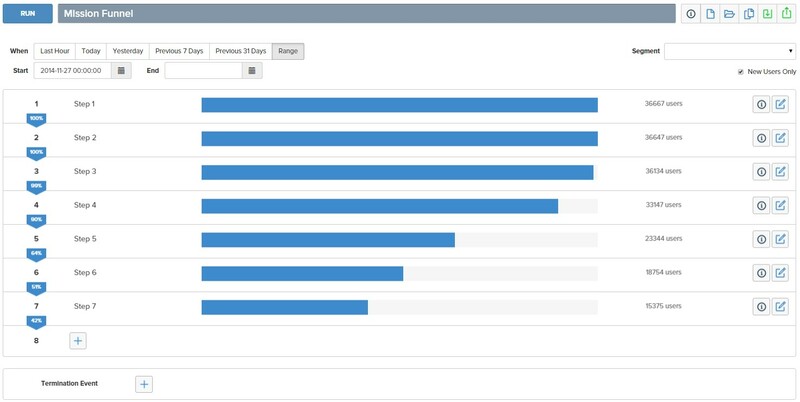 The Funnel Analysis tool lets you track the progress of players through sequences of events. Custom funnels can be created based on key events in your game and allow you to follow your players’ journeys; identifying where they drop out so that you can address retention issues or explore key monetization events and levers. A funnel is built up of a number of steps, each step is an event in the game. A funnel can contain up to 100 steps with users only eligible for a step if they successfully passed through the previous step. To refine the users, it is possible to select either all users or just new users as eligible for the funnel. You can also limit the funnel to players who belong to a particular player Segment. Each step in the funnel consists of an event, it is also possible to refine the users that pass through the step by limiting users by a criteria that is attached to the event. When you navigate to the Funnels tool you will be shown an empty funnel. At this point you can either Open an existing funnel by clicking on the Open button on the menu bar at the top of the funnel tool, or you can start defining a new funnel. The Funnels tool page is contains three main areas of functionality. The toolbar at the top of the funnel provides access to funnel management tools. The File menu contains options for creating New funnels, Opening existing funnels or Saving the funnel you are currently working on. You can also clone the funnel you are currently working on by clicking the Copy button. The name of the funnel can be edited from the initial “Untitled Funnel” to something more descriptive. You can also give the funnel a longer description by clicking on the Info button. The description will be displayed if the funnel is used in a custom dashboard. The Run button is used to run the query to populate your funnel steps with data. Clicking the Export button will let you export the funnel results as a .CSV file. The funnel steps section lets you view the results for each step or edit the step conditions. The percentage of the users who started the funnel that qualify for the step. A visual indication of the percentage of qualifying users. An edit button that can be pressed to show or edit the conditions for the step. e.g. which event and parameters are required for the player to qualify for the step. Each step in a funnel requires that the player record a specific event and match any parameter conditions defined as “Step Refinements” in order for the player to qualify. There are three areas to the funnel step editor. Specify a name for the step that will be displayed on your funnel. The drop down list will be populated with all events that are sending data in your game. If you add new events to your game they will automatically be added to this list when data starts being received from them. Choose whether the player can flow through this funnel step to a later one with a single qualifying event. There is a more detailed description of this functionality further down this page. The second step conditions row lets you specify if the step conditions need to be met within a certain time of the previous event step. Check the “limit time since previous step” checkbox and set the desired timescale. Additional funnel “Step Refinements” will be displayed in subsequent rows and can be added by pressing the “+ Step Refinements” button. The drop down list will be automatically populated with only parameters that can be sent with this event as described by your event schema. Therefore irrelevant parameters that would block a funnel step cannot be selected. and value that the parameter needs to contain. delete the step refinement by pressing the red delete button. Remember to Save any modifications before leaving the funnel tool using the File->Save or File- Save As options on the Funnel Management toolbar. Additional funnel steps can be added to the end of a funnel by clicking on the Add step button at the end of your funnel. Funnels can be up to 100 steps long. A termination event can be added to your funnel if you need to prevent players from progressing further in the funnel after recording a specific event. The “flow through following step” checkbox on each funnel step is set to False on all funnel steps by default but can be set to True if required. When set to False, the player needs to record a distinct, qualifying event for each step in the funnel. e.g. 1 event = 1 step progress. 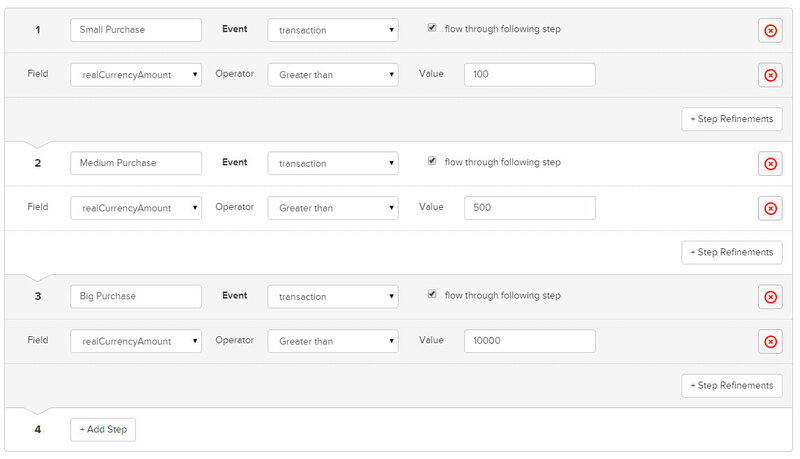 If you set this to True the player can flow through multiple steps in the funnel with a single event if it matches the qualification conditions for each step. Consider the following funnel steps. With the “flow through following step” filters set to True the player can proceed straight to step 3 with a single large transaction that exceeds 10000 cents ($100 if currency USD). If they are set to False a distinct event will be needed for each step, therefore a minimum of three purchases, each qualifying for the next step will be required. Funnel queries are now re-calculated each time you run them, so they can take from a few seconds up to several minutes to return depending on the complexity of the funnel. In general it is the number of players at each step in the funnel that has the most impact to performance. e.g. A funnel that contains 100% of your players on step 1 and has a very gradual falloff is going to take longer to calculate than one the constrains the 1st step to players belonging to a particular segment or filter group, or has a more dramatic falloff.